I've been a professional soccer training coach on and off for the past 20 years, and I've worked on almost every continent around the world so I can honestly say that I've seen a huge variety in soccer training techniques and styles. Some good, some bad and some downright ugly!!! However, this experience has made me even more passionate about passing my knowledge onto others around the world so they too can learn and develop the skills of themselves or others and make out beautiful game, even more beautiful! What I can tell you for sure, is that the top players in every club that I have coached at, weren't the ones who were blessed with natural skills, but were the ones who were dedicated and the hardest working. These were the players who were the first to come to training and the ones who'd stay behind and ask if they could just practice a few more free kicks. In this series of posts, I've written more holistically about soccer training and will touch on everything from weight training to the importance of sticking to a soccer training plan. Through Soccer Training Lab I'll give you as much information as I can pass on from my many years of soccer training and coaching experience. However, unfortunately I don't have a full team ready who can help me prepare fantastic video content for this site. For a start it would be extremely costly to do that and secondly I don't think it is needed as I believe there is already fantastically good and value for money content available. 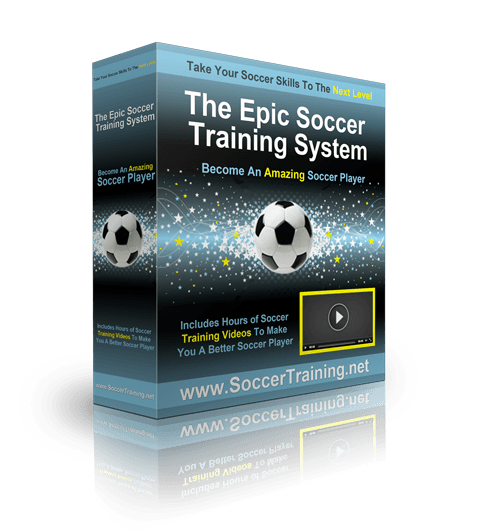 I would highly recommend the Epic Soccer Training System, which both myself and over 10,000 other soccer players have been through. Epic Soccer Training was created by Matt Smith, a former professional soccer player, who was named an Adidas All-American Player. This series of soccer training videos is the ideal compliment to Soccer Training Lab and any other training programme you may be involved in as it covers content for everyone from the complete novice to the full time pro.